His Highness, Sheikh Khalifa bin Zayed Al Nahyan, President of the United Arab Emirates, recently approved two new laws aimed at enhancing the flow of foreign direct investment (FDI) into the Emirate of Abu Dhabi. Abu Dhabi is considered to have one of the most stable and vibrant economies in the Middle East and is widely considered as fertile ground for inward investment. The first new law, Law No. 1 of 2019, relates to the establishment of the Abu Dhabi Investment Office (ADIO) which will have responsibility for overseeing the implementation and execution strategy for increasing FDI in the Emirate. The second new law, Law No. 2 of 2019, will regulate Public Private Partnerships (PPP) in Abu Dhabi. improving transparency and engaging with businesses in Abu Dhabi. The introduction of Law No. 2 of 2019 provides a framework for regulating partnerships between the public and private sector in Abu Dhabi. It will help to further enhance the Emirate’s FDI strategy with a view to supporting the participation of the private sector in certain key strategic sectors including technology, urban infrastructure, education, healthcare, housing and transportation. In doing so, the ADIO has stated that it will “support investors in making commitments in line with Abu Dhabi’s economic strategy and work with government and private sector partners to use financial, technical and regulatory criteria to screen proposed projects and assess their feasibility for PPP”. 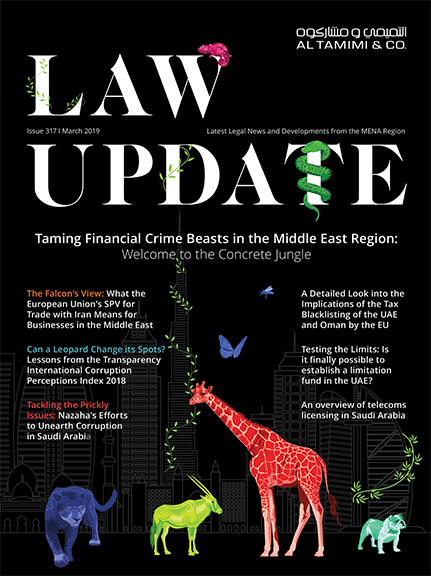 The introduction of these two new laws represent a significant milestone in further cementing the Emirate’s longstanding commitment towards developing and diversifying the local economy and ensuring it continues to provide investors and other potential stakeholders with a robust, yet business friendly, regulatory environment within which to invest. With our extensive experience of doing business across the MENA region, we are well-placed to assist in the structuring of PPP projects. We are experts in preparing project documents, from concession agreements (if acting for governments) to construction, operation & maintenance, financing and joint venture agreements (if acting for the private sector), as well as in advising on the insurance, property and regulatory requirements of projects.